Describe the Marketing Cloud project phases. Map service offerings to Marketing Cloud project phases. Demonstrate how service offerings align with customer needs. As a Salesforce partner, customers come to you with all types of requests. We could lump them together, but we’d end up with a heap bigger than the world’s largest ball of twine. Let’s take a tidier approach and sort customer requests into three project phases, capture, deliver, and maintain. The phases correspond to the advisory, delivery, and support revenue streams. Now that we’ve got a sorting framework, we can look more closely at the services offered during each phase and choose target phases. The capture phase has a certain Wow! factor. It’s a time for ambitious ideas. In this phase, your team investigates, brainstorms, and strategizes. You can smell the coffee and whiteboard markers from here, can’t you? Their efforts produce innovative, transformational ideas that captivate customers. It’s just the kind of thought leadership that Salesforce customers expect. Just listing these work products doesn’t tell you much. Let’s look at an example that illustrates the common theme for all advisory services—generating new ideas to fuel growth. Northern Trail Outfitters (NTO) wants to revamp their customer rewards program. They have a visionary goal in mind—to create innovative personalized experiences for each of their customers. They hire an advisory services team to create a transformation roadmap and rally stakeholder support behind it. Are you wondering if advisory services are a good fit for your team? Consider a sport like cricket or tennis. When you hit the ball in the sweet spot, you get a better hit with less effort. If you’re starting with a team of business and marketing consultants, advisory services are your sweet spot. Choose to exclusively focus on advisory services or start there and expand into other phases. Like bees in a hive, delivery teams produce. They’re busy with sprints and scrums, and their output is technical customer solutions. It’s not honey, but to customers it’s just as sweet. Let’s take another look at NTO. Their new rewards program is built on the Salesforce Platform and Marketing Cloud. With this solution, NTO can create a smarter, more personalized customer experience. Their customers get tailored content and offers. And regardless of how customers interact with NTO, whether it’s in person, via an app, or using a digital assistant, their experience is consistent. A delivery services team includes technical experts, architects, developers, and deployment specialists. It also features business consultants who advise customers and manage projects similar to NTO’s. As Salesforce continues its own rapid growth, customer demand for solution delivery services is growing right along with it. Think about what happens at the end of the delivery phase. A customer aims to take full ownership of a complex solution. This can be a tricky transitional time. Not every customer is initially ready to take on maintenance of that solution. Some prefer ongoing help with day-to-day operations from a Salesforce partner. For these customers, you can provide training on both the Salesforce platform and their unique solution to foster solution adoption and ensure your customers’ long-term success. Your team can also provide first-line technical support. Customers appreciate going directly to you instead of to general tech support. You can be the intermediary between the customer and Salesforce tech support and help identify the nature of your customers’ problems. With your close working relationship, you can give your customers a more personalized approach to solving their technical and nontechnical issues. Think again about NTO. Inside their rewards program, a proprietary algorithm rewards individual customers by factoring in not only what they purchase, but how they purchase it: in person, online, or through social media. As NTO continues to innovate, their solution must evolve at the same pace. They want to partner with support teams like yours to manage this evolution. Even though support is as critical to customer success as advising and delivering, it’s not always as glamorous. If you’ve ever struggled to decipher a solution that resembles a Rube Goldberg machine, then you understand why. Because of this challenge, maintenance can be a neglected phase in a project. But you work with Salesforce implementations—the cream of the crop—and you know that there’s no need to cringe at the thought of maintenance. That leaves the support phase door wide open for your team to step through and delight customers waiting on the other side. Make sure that you have technical experts on staff—developers, trainers, and project managers. With the right support, anything is possible for our customers. It’s time to use what you’ve learned about service offerings and revenue streams to choose your target phases. As a Marketing Cloud practice lead, it’s your job to decide whether you want to target one, two, or all three. 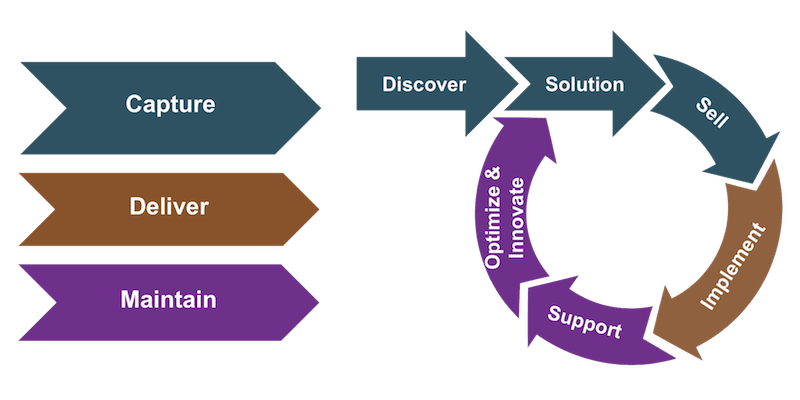 Customers want to partner with a team that can identify their business problems and propose solutions, deliver those solutions, and provide training and ongoing support. Target all three phases to provide the comprehensive end-to-end coverage your customers want. Multiphase engagements imply higher revenue potential for you. That sounds great, right? But, you must be prepared to execute. With the right skill set, your team easily can. However, asking a team of business strategists to offer delivery services is like hiring a sculptor to cut your hair. No thanks, you say? Good call. So, how do you decide? Take an inventory of the skills your team excels in today. Decide on the service offerings your team wants to provide. Identify gaps between existing skills and those needed for your chosen services. Fill the gaps—add team members, partner with other companies, and train your team. And remember, you’re part of the Salesforce Ohana and have training and support at your fingertips in the Salesforce Partner Community. That’s help you can rely on as you build and expand your team.